We all know the difficulties of raising a newborn. As babies grow and become mobile, everyday things become dangerous thus making it imperative for you to take steps that will ensure their safety. Those staircases, rooms, fireplace, furniture, and pricey decorations will need to go but that’s not practical. Using baby gates, you can create safe places for your baby to crawl, walk and play in. Enjoy stress-free cooking, cleaning and relaxing with peace of mind knowing the baby gates are blocking and ensuring the safety of your child from everyday harmful situations. Some parents like creating secure play areas in the middle of rooms, others like keeping the family pet out. Whether you need a safety gate for your staircase or a retractable baby gate for a doorway, there are a wide variety of options, some better suited for your needs than others. 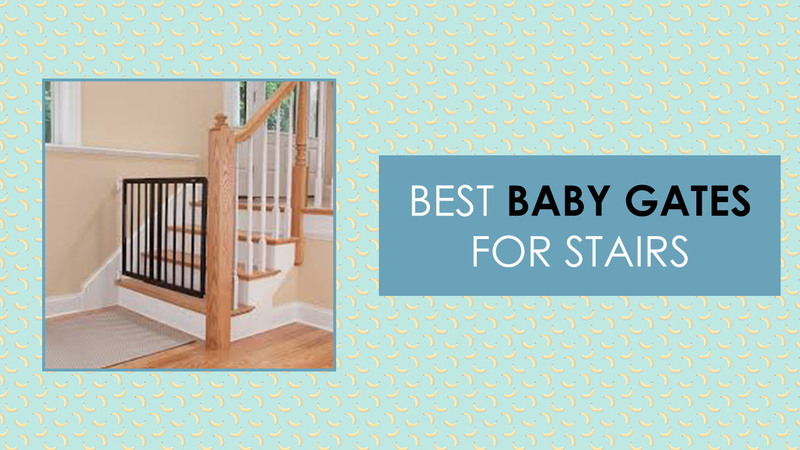 When looking for the best baby gates for stairs, you really should know where you’ll be putting it to better ser the safety needs of your baby. You should first know the dimensions of the doorway, stairway and wherever else you plan on using it. All baby gates have a minimum and maximum extension length, knowing this will help you purchase a safety gate that you can use around the house. For areas that only have one access way, having a baby gate with a door is ideal since it will go a long way to secure and guarantee the maximum safety of your baby. You don’t want to be constantly setting up and down the gate, or trying to climb over if the baby gate you chose does not have a doorway. Toddlers are clever and fast learners, you want a baby gate that they can’t easily learn to open and escape from. The design should also not allow them to climb or slip through. Having a baby proof gate is a must, or let’s face it, What was the point. The safety of our child is priority number one, much like every parent. The products we use and interact with our child should be safe. We should make sure the baby gate has no pinch points, moving parts easily accessible or removable. Apart from the safety feature, baby gates should be well built. Your young one will quickly learn to lean against the gate, pull on it and try to climb it. Whatever the situation, safety gates for kids should be well secured and sturdy. Purchase a gate that fits your lifestyle and home, it’s way better to have a secured gate that will fit in multiple places around your house and suit your baby’s safety needs and yours as well. It doesn’t make sense to purchase a baby gate and find places around your house that it fits. Your baby loves to be around you, and you love to give your baby a safe place to explore his world, and a gate will allow for that. Our 1st best baby gates, this model, the Supergate baby gate is known for building quality and sturdy gates for children. It is one of the best baby gates on the market. Whether you need a baby gate for a hallway, stairs or a door Supergate baby gate offers several models with different designs and sizes that will help secure your child. The Supergate baby gates are easy to set-up, have a triple locking mechanism making it childproof while being able to open and close it with one hand in both directions. 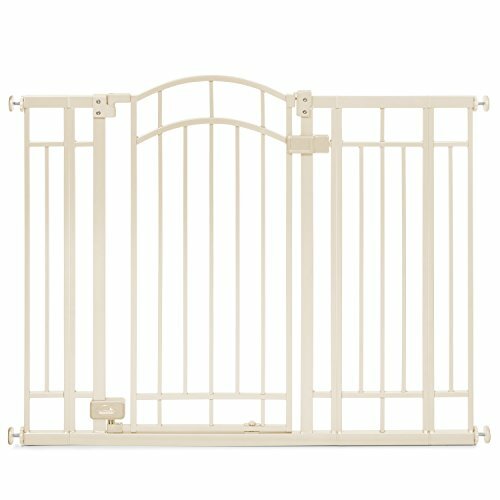 This gate is 30″ high and 29.5 inches – 38.75 inches wide, the unit does come with an extension. This baby gate is perfect for bottom of stairs, top of stairs and between rooms for extra safety. This gate is very easy to set up and can be done by one person no assembly is required, it uses extending tension knobs. A neat feature is that the sturdy Supergate baby gate can be opened all have it stay open in either direction or open it and have it automatically close behind you and lock thus ensuring the safety of your little one. Our 2nd best baby gates, Evenflo Easy Walk-Thru baby gate is designed to be used for the top of stairs. It is considered to be one of the best baby gates you can get for your child. The sturdy unit is 30″ inches tall but can be made 33″ if you leave a maximum 3″ gap, and 29″ to 42″ Inches wide. The really neat thing about these baby gates is they feature a green/red indicator that tells you if this gate is locked or not. The Evenflo Easy Walk-Thru baby gate features a one hand release handle that your little baby won’t figure out. This gate are also great for hallways, doorways or any other room you can think, just make sure the dimensions work. When you open this gate, there is no bar that you can trip over making it great for the bottom of the stairs as well. Unlike other gates, you do require tools to set up this gate. You should use a drill to secure the Evenflo Easy Walk-Thru baby gate to the wall, ensure you use studs. Some purchasers have reported that this gate does wear down and shift over time, we suspect that’s caused by poor installations but it’s something to keep in mind and watch out for nonetheless. 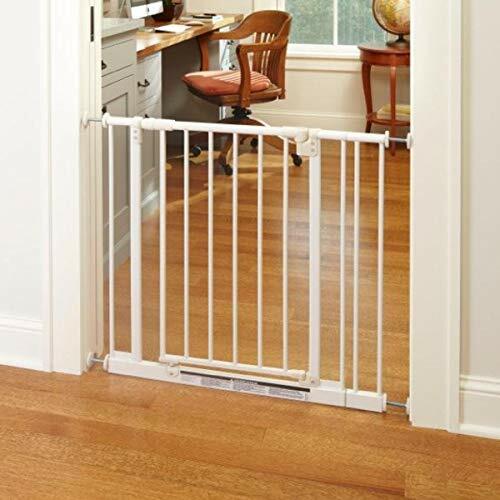 Summer Infant walk thru gate makes a rugged and well-designed baby gates for children and pets. Their gates are 36″ tall and 28-48″ wide making it perfect between bedrooms, play areas and hallways. Summer Infant baby gates do come with hardware that will require tools for assembly, you don’t have to use them but they may improve the sturdiness and security of the Summer Infant baby gate thus ensuring the safety of your baby. This gate auto locks with a dual locking system giving adults who don’t know how it works problems and toddlers no chance of figuring out how it opens which is another way that it guarantees your little one’s safety. This Summer Infant baby gate does have a bar that goes along the bottom of the walk thru area making it not ideal for top of stairs. The build quality of this baby gate is top notch, made from metal ensuring it does not ware and can take abuse, the downside, of course, is that it does make a noise when it slams shut. Next up on our list is the Cardinal Gates Wood Gate designed for children. It is one of the best baby gate on the market. If you take your time to analyze its popularity, you will definitely be encouraged to give it a try. A good Amazon rating along with an array of delightful features should be enough to warrant applause for the sturdy baby gate. Guild up the loins of your mind and join us on the quest to appreciate the associated positives and negatives. Well, the feature set relays a lot of information about the superiority of the Cardinal infant gate. It the versatility to be used top and bottom of the stairs and thus holding a distinct advantage over most baby gates. It will definitely not be a wrong move if you include the Cardinal baby gate on your options list. This is another amazing baby gate designed for your child. Simplicity and usability define the hallmark of this baby gate. It’s obvious that the designers were committed to these values considering the abundance of features it brings on stage. Let’s have a little trip to breeze through the baby gates highlights. Great for top of the stairs. To sum this gate up, you can see it was pretty much a hard job for us to point out some grave weaknesses you should brace for. This gate basically has all the essentials you need for an effective and reliable mounting. It provides great value for the coin it demands. 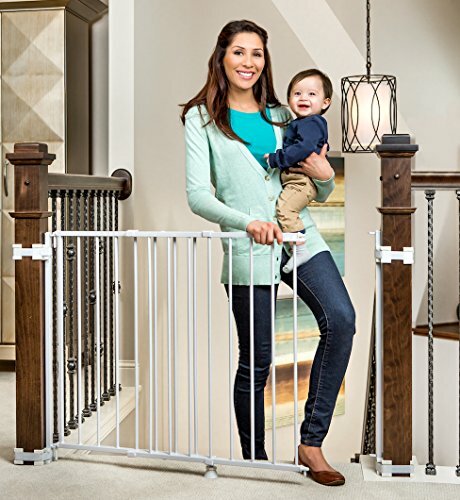 If you are up for a sturdy and durable best baby gates designed for stairs, the Regalo Expandable Metal gate with a banister is a worthwhile option to consider. The material and the overall design of the baby gate has a lot to show for and an Amazon review rating of 3 out of 5 stars bears testimony to the difference it has made in people’s lives. Let’s have a glimpse at the regalo highlights. Easy to adjust the height through an easy knob at the bottom. It is a two-way baby gate. The baby gate can be modified easily fit your stairway. The LATCH system becomes weaker with widening this gate. The banister adapters come with a single one rounder thus necessitating the purchase of some more adapters. The LATCH coupled with the baby gate is not good for repeated use. All in all, it may have a few issues on the negative side but the Regalo baby gate is definitely great addition to the baby’s inventory. The associated price tag is reasonable and you are assured of great quality once you get this gate on board. 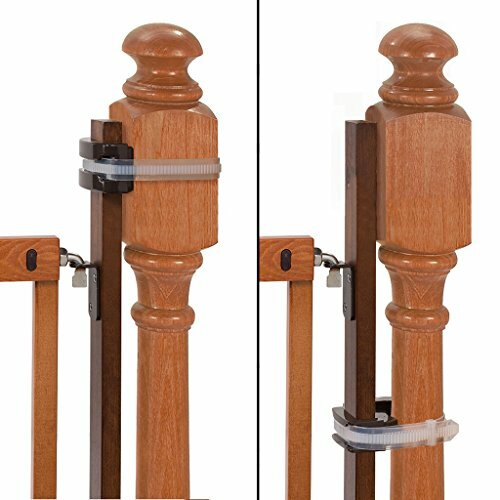 The Summer Infant Banister to Banister Universal is a great mounting kit that is designed to provide you with an easy solution towards mounting a secure baby gate from banister to banister without the need to drill into anything. The price tag and the long-term value that the gate mounting kit provides shouldn’t be disappointing. Let’s look at the associated features. The Summer Infant Banister to Banister Universal baby gate mounting kit can be fitted with most round or square shaped banisters. The kit can be used with pressure and hardware baby gates extending up to 37 inches high. The banister to banister baby gate mounting kit can function in between banisters, doorways, upstairs and at the bottom of the stairs. The pack includes two installation posts, six brackets, four security straps, and 12 wood screws. The gate kit is mountable to spindles more than 2 inches in terms of diameter. All in all, this mounting kit presents a reliable solution towards achieving a secure baby gate that will leave the child with almost no chance of tumbling over the stairs. A great feature set along with a durable design provide a valid argument for fishing out a few bucks from the pocket. 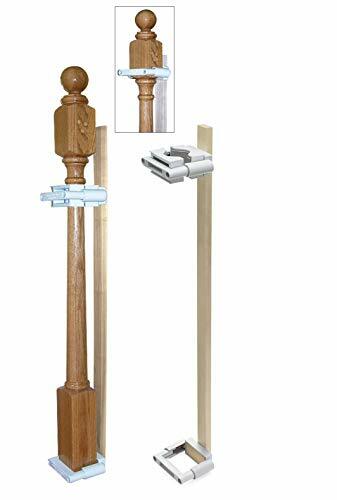 The baby gate mounting kit is definitely a great Banister to Banister mounting solution. A good alternative to the Summer Infant gate mounting Kit is the No Hole Stairway Baby Gate Mounting Kit. The security it provides is top class through an anchoring system that is not only easy to install but provides a good grip that ensure ‘Mr. aggressive’ doesn’t have a great time dislodging the baby gate. Let us have a little appreciation of the features of the baby gate mounting kit and other associated issues. The baby gate mounting kit is compatible with posts that are within the 2 ¾ – 3 5/8 inches range of the space in between. The pack includes a mounting wood along with a set of hardware to install at one side of a gate. Can only be used with hardware gates. The baby gate mounting kit is easy to install. The baby gate mounting kit provides a stable anchoring system. It is not compatible with gates more than 36 inches considering short wood plank, otherwise, there are no significant problems. A top-notch feature profile makes this gate kit a worthwhile addition to your safety measure. It enjoys a share of positive reviews all over and boasts great overall performance though it has some issues with baby gates of more than 36 inches. Seeing your baby getting strong and exploring around is one of the best experiences associated with parenthood. Seeing those little limbs being able to carry the weight thus enabling the baby to get on exciting adventures around the house or the yard is exhilarating. However, this comes with a genuine safety risk because it means the child is exposed to areas which can be dangerous to his or her safety. Every committed parent knows this cannot be left unattended and appropriate measures should be put in place that will keep the baby out of the hospitals. This is where baby gates come in because they provide a highly practical solution that will keep your baby out of the dangerous areas of the house. Chances are that you may have already considered getting a baby gate before but aren’t sure on how you will get the best you can get considering the number of models on the market today. We are dedicating this review towards assisting you with having the right information needed to empower you towards getting the best baby gate you can get on the market. We will start by looking at the basics associated with baby gates before we extend our interest to look at some of the most credible baby gates on the market today. Let’s begin by looking at some of the most common questions about baby gates? 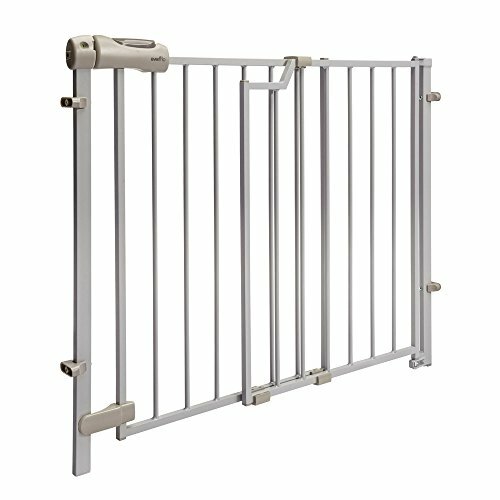 What’s the difference between Hardware and Pressure Mounted baby gates? And which baby gates are ideal for stairs and doorways? Pressure mounted baby gates are the most popular of the two, and they hold a much more affordable price tag. Apart from the price tag of the baby gates, another obvious advantage they hold is that that they do not need to be mounted through drilling holes into the wall. The wall corners of the pressure mounted baby gates have spindles that end with a bumper, giving it the look of a large screw. The baby gate mounting process involves unscrewing of the spindles till they get a firm grip on the wall. Pressure mounted baby gates have a heftier rock-star status because you don’t have to compromise the quality of your walls by drilling some unpleasant holes to fit them in. However, it is worth noting that you are not 100 percent spared from any wall damage because the bumpers of the baby gate have the ability to chip the wall paint, induce some depressions and even cause some mild holes on the wall though it’s not a common thing among consumers. If you are set to get a pressure mounted baby gate, you can evade this damage through pressure mounted wall protectors. These protectors function by distributing the pressure on a larger surface area thus minimizing the chances of having your walls quality compromised. In general terms, pressure mounted baby gates are not for the top of stairs mounting because they do not necessarily eliminate the risk of dismounting and having your child falling through them. Hardware mounted gates basically use a different mechanism that will achieve the security you need. They utilize brackets that you drill into the wall to get the baby gate connected to. This is probably the reason they are also referred to as wall mounted baby gates. When compared with pressure mounted gates, they result in a firmer barrier that gives the baby almost a zero chance of dislodging the baby gate. This makes the hardware mounted gates ideal for top of the stairs mounting. If you are considering to get something more permanent and don’t really mind to get a few holes drilled into your walls, hardware mounted baby gates are definitively a great option. Pressure mounted gates have the advantage of functional simplicity as they can be easily installed or moved, but when it comes to a case where you only need something that provides a long-term solution, the hardware safety gates are the way to go. Now let’s look at the general guidelines that govern baby gate installations. Pressure mounted baby gates are a breeze when it comes to installation when you have regular and even surfaces. 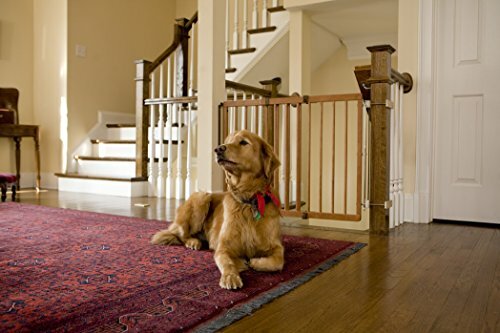 Generally, they require flat surfaces on either side to get a firm grip that won’t allow any failures when the little one gets physical on the gate. With this in mind, you should definitely be clear and precise on how big the area you want to install the pressure mounted baby gate in is if you get a good hit. This necessitates the need for getting your hands a little dirty by getting the tape measure and do some measurements on the area. Pressure baby gates don’t come in a one size fits all solution. You hold the responsibility to get the best baby gate for your home. Check the measurements of the baby gate online or other sources to make sure you are not trying to fit a tennis ball into a needle’s hole is a wise step. Manuals can be boring stuff but they exist for one essential purpose. Making sure you know how to use the pressure mounted baby gate appropriately. Get through the instructions to make sure efficiency is achieved. Understanding the instructions can be the fine line separating a secure baby gate from an inconvenience that does nothing more than making things more dangerous. Having read the manual, make sure you go through the process as stipulated in the manual book. This may seem obvious but a few overlooked details can make the difference between a lousy and worthwhile experience. Just as it is the case with pressure mounted baby gates, make sure you go through the manual book completely. I know after reading this sentence you are like ‘gratitude Mr. obvious’. I have deliberately put this across because it’s a stern requirement that cannot be overemphasized. Don’t just read, get some visual help. It is an established fact that people are more likely to understand whatever is being talked about when visual demonstrations are used. This universal truth doesn’t leave the baby gates spared. You should definitely get through some ‘how to install’ videos on either u tube or Vimeo to reinforce your understanding. What are the consumers saying? It has always been a perpetual truth that experience is the best teacher. Chances are that whatever you are buying has been brought by myriad others and you should have a glimpse of what their experience has been like. You can get through numerous reviews but there may be some practical issues that may be overlooked, and a good way of getting across them is looking at actual customer reviews at some authority sites like Amazon. You cannot afford to get anything on the market simply because you can afford it. DO YOUR HOMEWORK FIRST! The truth is that most baby gate instructions don’t get through everything related to the installation process. You may find out that there are some measurement inconsistencies that may come up like having something that is bigger than it is stipulated online. The key to avoiding this is getting the measurement done at least twice, otherwise, prepare for any probable inconsistencies. There is this simple detail that matters a lot. The associated door should be one way. It should go in one direction and away from the stairwell. How are baby gates for top of stairs different from the bottom of the stairs? They are mounted on permanently. They are made to open only one way. They are installable at an angle, considering that the surfaces are not directly across each other. The bottom of the stairs does not really present a challenge in terms of the kind of stuff to think about. In other words, the bottom of stair gates is fairly easy to pick. There aren’t any special criteria to choose a bottom of stair gate. Anything that can be installed at the top can work at the bottom unless there is a really difficult configuration. How do I install baby gates in uneven walls? When it comes to uneven walls, there is a number of configurations you are likely to encounter. Its either you have a scenario where you have a single post on one side or both, or you have a single anchor point or nothing at all. In general terms, if your top of stairs doesn’t have any flat surfaces, you are probably having a number of blusters and a possible Newel post. When you are stuck in this situation, you should find a baby gate that can be installed in such a setting with a corresponding set of adapters. A good option is the Kidco Safeway Gate which has a really effective set of adapters. In the case where you don’t have a wall or post to attach to, there isn’t any normal baby gate that can handle the job. You will surely need to improvise. Constructing a play yard can be the only available option which basically involves anchoring several baby gates together. If you are looking for solidity, metallic material has always been the go-to option, owing to the superior strength it provides. You are bound to come across hardware and pressure gates that are made of metal. If you are considering getting something solid for the top of the stairs, Metallic hardware baby gates are the obvious choice. Having said this, it does not necessarily imply that wood and plastic gates are useless. They are capable of providing considerable strength too, but its best to avoid them when you are considering a top of the stair mount. However, if all you need is to have the little one outside a particular area, you can do with one of the wood or plastic gates. It can be a little tricky to attach your baby gate to stairs with banisters. Fortunately, there are best baby gates for stairs which are advanced enough to fulfill their purpose even with banisters in place. Basically, banisters can be overcome by means of adapters that may come with the baby gate or purchased separately. Baby gates are without doubt a great addition to the baby’s inventory. Just like most baby products, the best choice is a product of a careful research and using the knowledge gained through relating it to the financial muscle at hand. The little one deserves the best treatment when it comes to safety and the expositions stated above should be a great leap towards achieving this leap. Fare thee well and we wish you all the best as you are doing the best you can to keep him/her safe!